In this issue, explore traditional tools such as Tambour, Knitting, Crochet, Punch Needle and Flowermaking; Knit a Viking cable beret; Discover the ultimate helper - sewing birds; and finally, Bosnian Crochet. This issue features quick and easy knits such as scarves, drop stitches and little girl dresses; Beach coverups; Flower Looms and 5 easy flowers to make - Be sure to enter for your chance to win a Bloom Loom! Check out the website (link can be found in the "Magazines" tab at the top of the page) for details. Here is a list of the magazines I have recently purchased. You can find links to the websites for all of them up on the "Magazines" tab at the top of the blog where you can subscribe, purchase back issues and more. 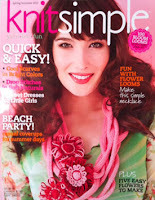 Simply Knitting - March, Issue 90 - Comes with super cute needle gauge in the shape of an owl! The Knitter - Issue 41 - Jane Sowerby Cowl on the cover looks absolutely gorgeous, as well as the Louisa Harding free bonus patterns! 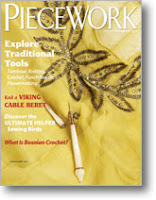 Debbie Bliss Spring/Summer 2012 - Beautiful lace and color work in this issue. Lots of beautiful projects as always. OK, that is going to wrap it up for what's in my magazine stack this time around. Happy reading!